Intergalactic war? That's just not cricket or is it? The Doctor promised Romana the end of the universe, so she's less than impressed when what she gets is a cricket match. But then the award ceremony is interrupted by eleven figures in white uniforms and peaked skull helmets, wielding bat-shaped weapons that fire lethal bolts of light into the screaming crowd. The Krikkitmen are back. 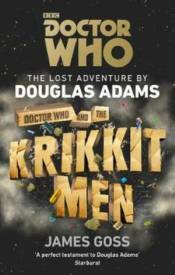 From Earth to Gallifrey, from Bethselamin to Devalin, from Krikkit to Mareeve II to the far edge of infinity, the Doctor and Romana are tugged into a pan-galactic conga with fate as they rush to stop the Krikkitmen gaining all five pieces of the key. If they fail, the entire cosmos faces a fiery retribution that will leave nothing but ashes.